A manned asteroid mission using two Orion spacecraft, docked nose-to-nose to form a 50-ton deep space vehicle, is being studied by Lockheed Martin Space Systems as an alternative to resumption of U.S. lunar landing missions. The Orion asteroid mission concept is being unveiled just as the Presidential committee reviewing U.S. human space flight is citing asteroid missions after 2020 as a less costly alternative to NASA's proposed lunar landing infrastructure. Results of the review will be briefed to President Obama by Norman Augustine, committee chairman, by the end of August. 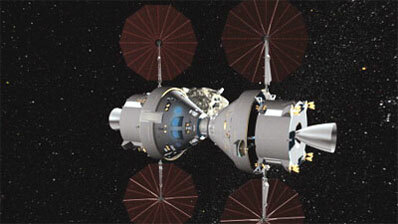 The docked Orion configuration as shown in a Lockheed Martin graphic (above) would have a total of four large solar arrays and two service modules as well as two command modules for extra space on the several week flight. Single 25-ton Orion spacecraft would first be used to replace the space shuttle for servicing the International Space Station. But use of them for asteroid missions and other deep space sites would maximize utilization of the Orion system if lunar landings are deleted as a near term goal. If one looks closely at the graphic, a space suited astronaut deployed from the Orion, is standing atop the asteroid. The graphic is from a Lockheed Martin promotional movie that shows concepts under study by the Orion prime contractor. Under the Bush Administration strategy, NASA had planned a resumption of lunar landing missions by about 2020 using the Orion as a lunar orbiting command ship while its crew descended to the moon in Altair landers for lengthy stays on the surface. The official NASA line has been solidly "all moon" for the last several years, while more realistic assessments over the same period have shown that is not feasible. NASA more recently, however, had become more open about an asteroid mission capability for Orion after space scientists and planners meeting before formation of the committee began to criticize the lunar goal as too fragile. Development and cost problems with the Ares 1 and Ares 5 launch vehicle programs have also become increasingly apparent since about 2007. Augustine and other committee members such as former astronaut Sally Ride have already reported publicly that NASA's current plan to retire the shuttle, finish the space station and return to the moon by the early 2020s is not even remotely feasible under NASA's current funding profile. Orion missions to asteroids would be useful to characterize and sample them. This would be important as early preparation to use some yet undetermined system if the need ever arose to divert an asteroid to save Earth from a devastating impact. 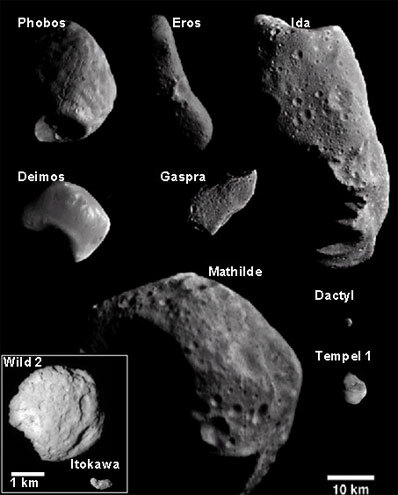 Some asteroids are solid bodies, while others are rubble piles of loose rock, making samples and close up characterization useful for diversion studies that would differ depending upon the type of asteroid threatening Earth. In fact a Lockheed Martin video titled "Orion For Crewed Science Missions" shows the twin Orion configuration closely orbiting an asteroid while space suited astronauts explore its surface. With the minuscule gravity of an asteroid, astronauts flying manned maneuvering units could travel between the Orion combo and the object without ever requiring a much heavier, and expensive, asteroid landing vehicle. The video, little noticed at the time, was shown in early August at a propulsion conference in Denver sponsored by the American Institute of Aeronautics and Astronautics. The AIAA "Joint Propulsion Conference" so called because it brings together multiple international agencies often makes news as it also did in 2008 when Chinese researchers openly discussed their scramjet technology program. At this year's event, the Lockheed Martin video was part of a presentation delivered by former astronaut Brian Duffy, now Lockheed Martin vice president and program manager for the Altair lunar module part of the Orion lunar landing infrastructure. Duffy's presentation also cited satellite servicing that could be performed by astronauts from an Orion configuration, equipped with a shuttle-type manipulator arm deployed from its service module. The presentation also discussed use of single Orion spacecraft to service geosynchronous orbit military and civilian satellites and the potential for them to travel to Lagrangian points to service telescopes like the giant new Webb space telescope set for launch in about four years. Lagrangian points balance out gravity from the sun, Earth and moon allowing spacecraft to remain parked at those locations. They are about 1 million mi. from Earth, about the same distance as some asteroids passing near Earth. This means Orions configured for missions to telescopes, like Webb, at Lagrangian points would have a life support capability also generally suitable for asteroid missions. The twin Orion design includes large service modules on each spacecraft to allow extra space for astronauts to live in. More importantly more capability to carry life support systems for several week missions could be carried in the two service modules.